Large cities are already populated by more than half of the world's population, according to a recent report by McKinsey which estimates that by 2050 this figure will increase to 2.5 billion people. This concentration of the global population makes it increasingly difficult to run these giant urban centers, posing problems of mobility, sustainability, and even security for inhabitants. In this context, the evolution towards Smart Cities stands out as a good option to manage these growing urban areas in a more intelligent and efficient way through technology and data, as well as improve the quality of life of citizens. I am sure 2018 will be a key year for the development of Smart Cities since the global investment in technology to boost them will reach 80,000 million dollars during this year, according to IDC. It seems clear that connectivity will be key to the success of Smart Cities. Until now, one of the key challenges for their development has been ensuring the existence of ubiquitous connectivity that is both accessible and reliable. The benefits of Smart Cities can only be achieved if there is continuous connectivity that allows devices to communicate between each other and city councils to have visibility over systems’ performance in an uninterrupted way. 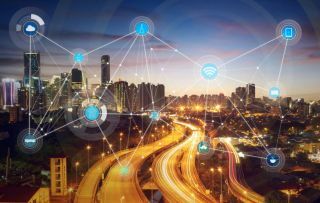 In the context of Smart Cities, WiFi is a natural enabler of this connectivity due to the high adoption of its standards, which allows a wide range of devices to be able to connect and communicate, as well as its relatively low cost of deployment. WiFi has many advantages over other technologies because it has evolved to suit many different applications. For example, new standards (802.11ah) have been developed to operate below 1GHz that have a greater range and are highly suited to applications such as sensors. However, in order to take advantage of the full potential of Smart Cities and face the high demand for data derived from their deployment, robust WiFi networks capable of offering the necessary connection quality for a broad range of applications will be required. As a result of the technological and social transformation which we find ourselves immersed in, in the coming years WiFi will evolve to hold a much more strategic role. From now on, I think offering connectivity to devices in isolation will not be enough. Instead, the priority will be to manage WiFi networks in a smart and simple way, ensuring the efficiency of service. Public WiFi networks will play an important role in the development of Smart Cities. Notably, operators should take advantage of community WiFi networks because they offer many advantages for Smart City applications. One of the most important factors to highlight is that they are efficient in terms of both investment and operating costs. Community WiFi networks do not require the deployment of additional WiFi infrastructure, but rather take advantage of residential CPEs that operators already have in their subscribers' homes, creating the network by converting them into public access points. In addition, they offer important coverage at a very low cost. This is important for ensuring the connectivity of devices involved in Smart City applications in places with limited coverage from other networks such as cellular. Another advantage worth noting is that community WiFi networks collect a lot of information that councils can then use to monitor and optimize services associated with Smart Cities. Metrics include mobility patterns and device location, as well as the concentration of people, among others. In order to enter the Smart Cities market before it is too late, operators should invest in solutions that facilitate the rapid and simple deployment of WiFi networks. In this context, carrier-grade WiFi solutions will be key to give operators the tools they need, not only to deploy and manage community WiFi networks, but also to optimize their performance and anticipate possible incidents ahead of time. Alex Puregger is CEO of Fon.